5. 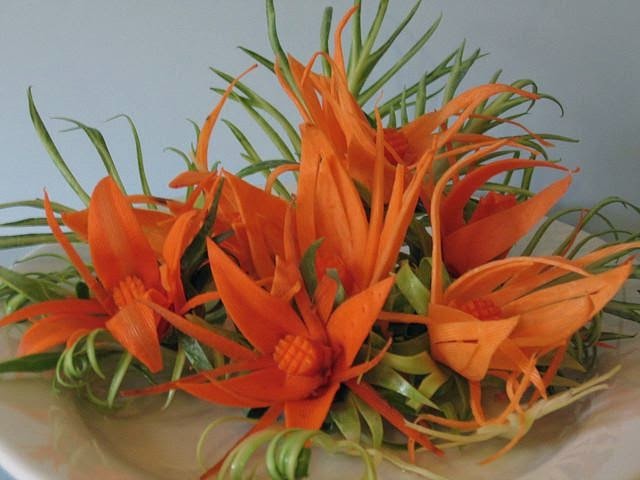 Great Carrot Flower Garnishing! 6. Create beautiful garnishes and platters! I am sure you liked this small series of videos showing you steps from cutting and storing radish to creating sweet flowers for your decorations. Will be posting some more great Vegetable Carving Video Series. 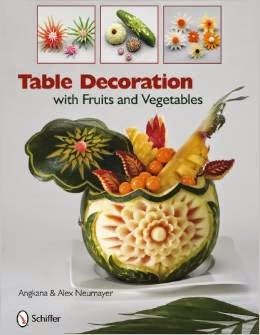 The scope of Vegetable and fruit carving is so large, that I thought of helping the readers by picking out potential Keywords and specific search items that fall under the preview of this great Art of Vegetable and Fruit Carving. I have listed out those specific words or terms that a Vegetable and Fruit Carving enthusiast would be often looking out for, and created a list of those words for you on this post. Under each Keyword I have tried to give you as many links as I could find of potential sites related to that key word. More links will be duly updated as and when found on the same post, so do keep a look out for new additions. Better still subscribe to a feed of this page. 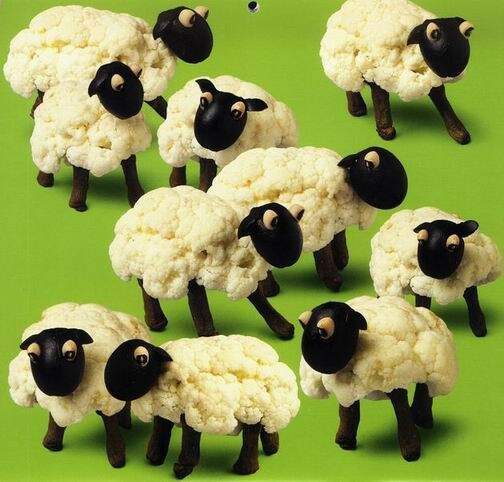 This post is purely dedicated to Vegetables and Vegetable Carvings Videos only. Separate posts for Fruits and Fruit Carvings, Tools and Kits, Books and DVDs, Courses and Classes, Images, Glossary, etc will be posted separately. I have given in an individual list with potential links against each keyword given below. All probable keyword possibilities were checked to get these results. 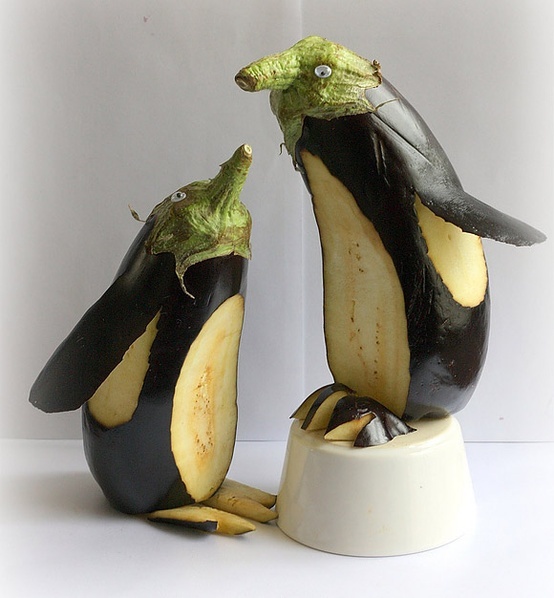 Where ever direct links to Vegetables or Vegetable Carvings Videos do not exist, I have given you good information about the vegetable respectively. Also you will find numbers 1, 2, 3,4,5,6, besides each specific word which implies there are more than one links available from different sites available for the reader. You may click on that numeric and it will take you to a new site or post regarding the subject topic. 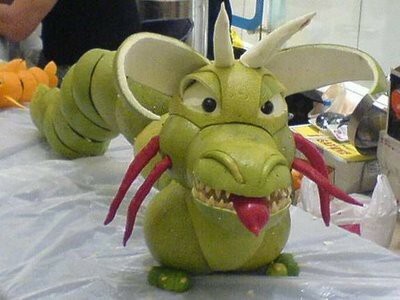 Vegetables and Vegetable carving Videos. The Five Ws, Five Ws and one H, or the Six Ws are questions whose answers are considered basic in information-gathering. 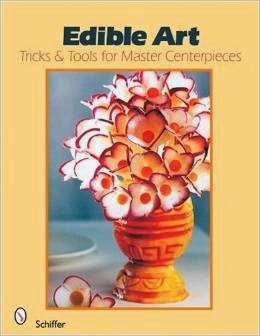 Today I will be applying the same to this wonderful Art of Vegetable and Fruit Carving. 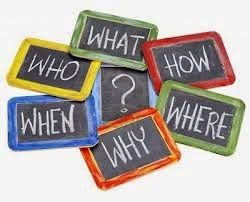 Let us see how each of these interrogative words can be applied in trying to get the most out of this simple yet interesting Frequently Asked Questions - (FAQ) session. I am going to make it more interesting by twisting the order of the Five Ws and One H in a way that it makes it more fun and easy for the reader to follow and understand. 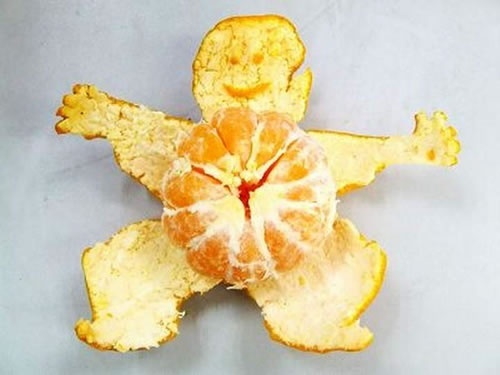 In this post I will only highlight the application of each of the Ws and the H to the subject of Vegetable and Fruit Carving and then we shall take up each of the specific interrogative sessions in a separate post by itself so we can deal with it in detail. Hopefully when we have dealt with all the Five Ws and one H about Vegetable and Fruit Carving we will have had a very clear panoramic view and understanding of this great Thai Art. Let us see how we can apply these to our subject of Vegetable and Fruit Carving and get the best of this Informative and Interrogative fun activity! For this I will be changing the order of the words so as to suit our subject. As mentioned earlier in this post I will only give a brief idea of what we will be expecting in the respective posts, and then my subsequent Posts will have the same headings so it makes it easy for the reader to relate with this post. It is possible that the same interrogative word can be viewed in different contexts which I will highlight in the respective posts. 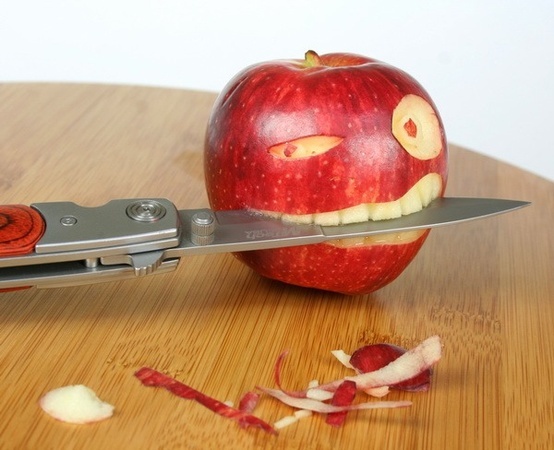 What - is Vegetable and Fruit Carving? ....In this question we will deal first briefly and then in detail about what exactly is this Art of Vegetable and Fruit carving and its use in both commercial and domestic circles. It will also deal with the when it can be used and where all this Art can be used. When - When of Vegetable Fruit Carving will deal with when and where this Art has originated, and the influences of each country on the styles of Vegetable and Fruit Carvings. Why - This question is basically covered in the What, but we shall deal in detail why this Art has taken the front seat and why it still commands the respect and liking of millions of Artists both Culinary as well as the customer who this appeals visually. Who - this section will deal with who, where and how this art can be used. In a later post I will be also dedicating to the Artists all over the world a literal Who's Who of the famous Artists all over the world. 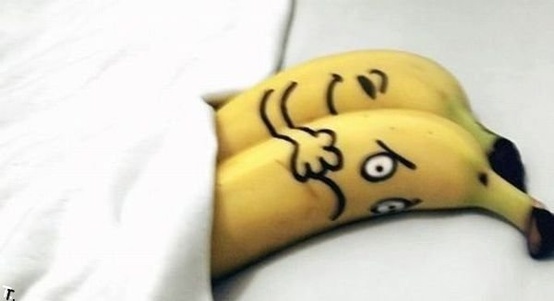 Where and How - I have combined these interrogative words as they compliment each other in the subject of How to Carve Vegetables and Fruits and Where to learn this Art of Vegetable and Fruit Carving. This will exhaustively deal with Training Institutes, Professional Artists and Academy who offer training on this great Art of Carving. I will try to give as many links or details where and How this Art can be learnt all over the world. The whole purpose of this small fun loving yet detailed activity is to enjoy this wonderful Art of Vegetable and Fruit Carving in the same way the Artists who create these work of Art, and equally in the same manner as it makes the presentation of this Art so pleasing. A lot of imagination, creativity, pre-planned activity and sheer dedication goes into creation of these work of Art as I always refer this to. The Outcome is sheer Magic and if we all try and understand the Five Ws and one H of this Art it won't be long before one of you or many more will turn out to not only be an avid follower but an Artist itself of this Art. As always the comments, suggestions, and views of my valued readers and patrons is invaluable and will be highly appreciated, so shoot off your ideas and comments and make this activity more fun loving and interactive! 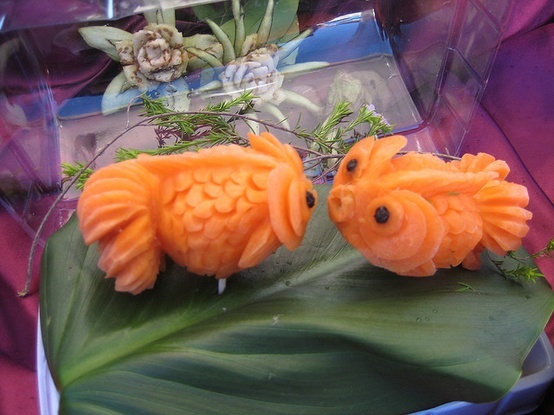 Great Vegetable and Fruit Carving Videos for you to watch. Continuing on my effort to bring to my readers the best of this art, I was watching some videos on Youtube and found some of them worth a mention. I have shortlisted these videos only on the basis of my own liking and the way the videos were presented, and also the utility value of those carvings for day to day display. I am sure you will like the videos. 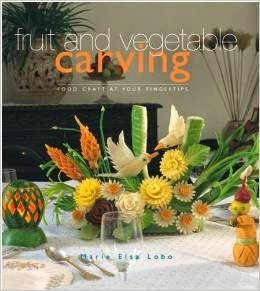 This video is a lesson in the beautiful culinary art of fruit and vegetable carving from www.carvinginstitute.com. Check out another video here...this exquisite carving of a Carving of a wonderful Rose from a Mango took my fancy. Though the video does not show the actual process of the carving it is a pleasure to look at it and get an idea of how the carving could be made. have a great time. While I was looking out for something exquisite, I just landed on this wonderful that I was longing for. A series of videos of Pumpkin Carving which are a sequence and sequel to one another. I am sure you will like the video. It only mentions that the carving is my one - nuee - Great carvings that are a treat to watch. I leave it to you to decide and also enjoy this series. Have a great time, till I look out for some more great videos. Keep watching.